Armeg Pro-Step Drill - (5 - 35mm) - the perfect tool for electricians wanting to create consistently accurate holes in trunking and sheet steel! Laser etched diameter markings enable the user to easily create accurately sized holes. 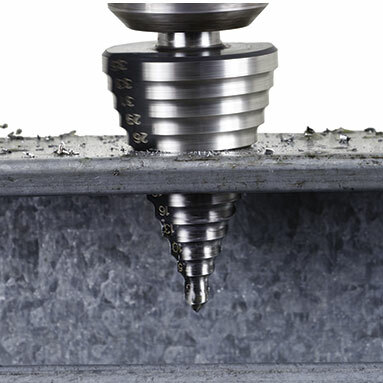 13 different drill diameter steps provide numerous hole diameter options. 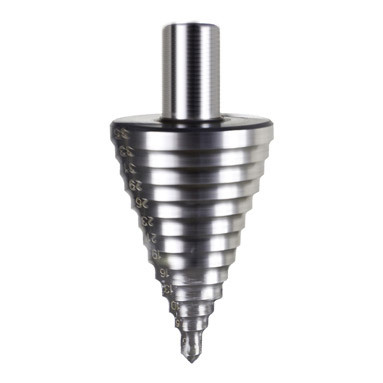 Precision ground, tapered cutting edges allow material up to 6mm to be drilled, burr free! Can also be used for drilling holes in plastics, plywood, formica and non-ferrous metals. Use cutting compound (AR-ECC002) when drilling with the Armeg Pro-Step to maintain sharpness and tool life.